The Grand Duchy of Luxembourg is a landlocked country in the Benelux bordered by Belgium, France and Germany and is the only Grand Duchy in the world. 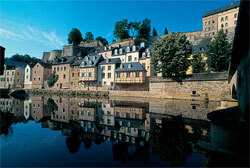 Luxembourg is the second smallest of the European Union member states. With a successful steel, finance and high technology industry and a strategic location at the heart of Western Europe, Luxembourg is one of the top three richest countries in the world and enjoys a very high standard of living.